.......53 Buddhas and Me .................My Life Adventures.....: What's your Favorite Animal? 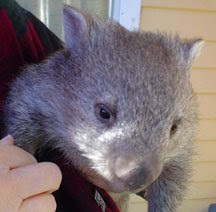 Yes it is in fact a wombat. I just love them, from babies to big old grumpy grand daddies. These shots were taken when I went to Flinders Island with Flavio on a work Educational. She was only a baby and had been left alone when her Mum was killed by a car. 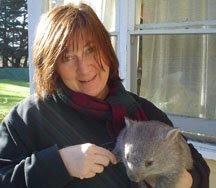 The lady who ran the refuge had about four baby wombats in here care. Flinders Island is quite a beautiful place to visit. The only thing that puts people of is that you can only get there in a small plane. Didn't worry me though I loved it. On the flight home I got to sit in the front with the pilot - oh my goodness it was so cool. I have a lot of socializing to do this weekend. Hey how about everyone that reads my blog lets me know there favorite animal. My favourite animal is the Giraffe ... but I LOVE when an animal 'crosses' my path because I know there is something I have to learn from it. Your Wombat is So Cute!